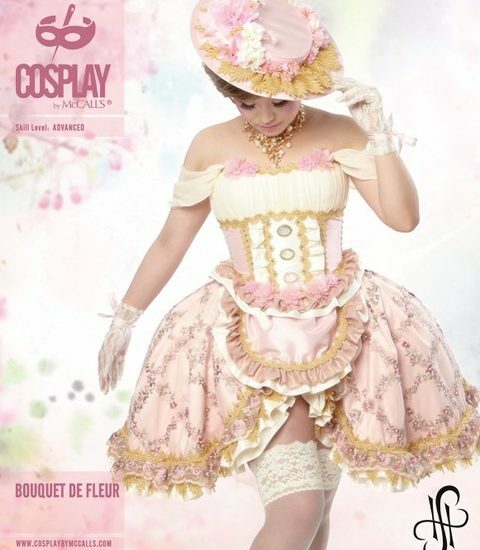 This Cosplay by McCalls release harkens back to their earliest patterns. This set seems to round out some of the earlier offerings, enriching the worlds they originally inspired. There are four patterns in this set, with a little something for everyone. 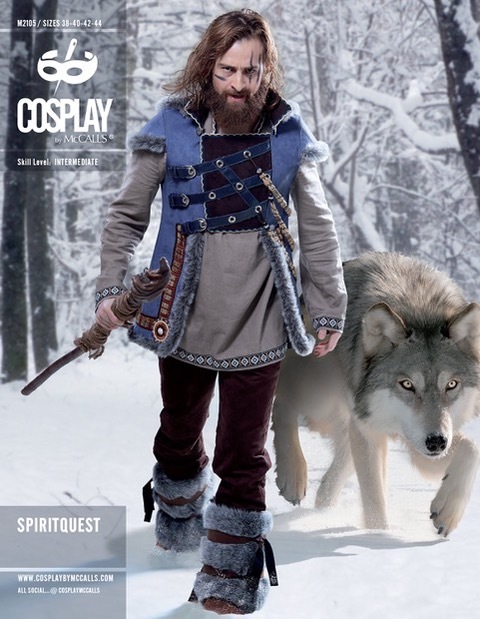 Spiritquest (M2105), skill level intermediate, looks to be a Lapland/Norse/Swedish/Guys-that-live-in-a-giant-ice-wall-inspired ensemble of shirt, vest, and hood. It would make a nice complimentary ensemble for Valor (M2052), Intrepid (M2051) and Cloak X (M2016). The vest is suggested as outerwear, along with the hood. They are both designed to be made up in synthetic leather or synthetic suede, like Ultrasuede. Construction is unlike most patterns: It is two layers of fabric fused and treated as one. The fur trim is just that: strips of fur sewn over the edges of the garments to bind the raw edges—in case there are any. The instructions are to bond the outer layer to the lining layer with fusible web, which they seem to call interfacing. Although fusible web is not interfacing, it will stiffen the fabric a bit, so be careful with your choices. Also be VERY careful in the fusing process as the cheaper faux leathers will melt. Use butcher paper between the fabric and iron if need be. Test on scrap first! This would also be great lined with faux fur, but don’t fuse it. The binding at the edges should be sufficient to keep the layers together in this case. Do not forget to cut a much larger size if you want fur to be on the inside. Add about 6 inches to the chest measurement to allow for the space the fur will take up. I am in love with the shirt/ tunic in this packet. It’s like a science fiction update of those Peruvian shirts the hippies wore in the 70’s. The collar has been changed from the expected stand collar to a neat shawl collar, and there is an inset of trim that laces up in the center front. It’s cool, and easy to wear. It deserves to be in your daily wardrobe. This entire ensemble would also be totally adorable and workable for women. She Cut (m2107), skill level easy, is another design from Seattle Cosplay. It’s a sweet little asian-inspired, sort of vaguely qipao-ish set. 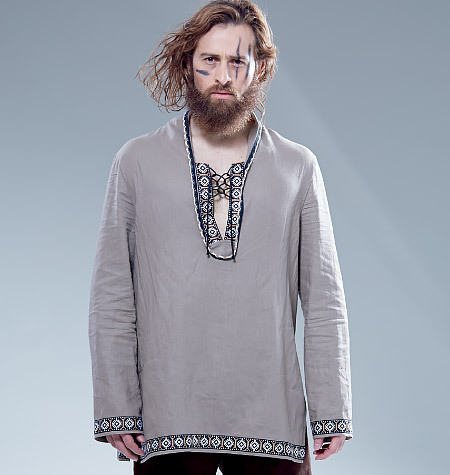 It fits with Obi: Gado (M2081). I’m hoping for something Hanfu-like in the future to round out the Asian triptych. 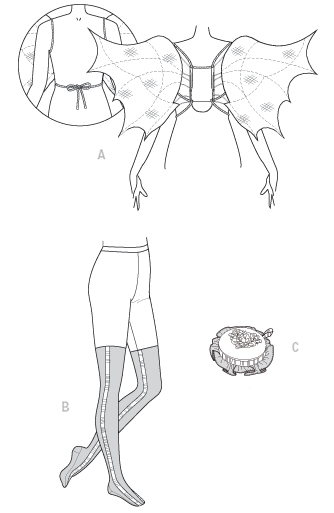 As usual for Seattle Cosplay, there are a lot of added details on some pretty garment shapes. 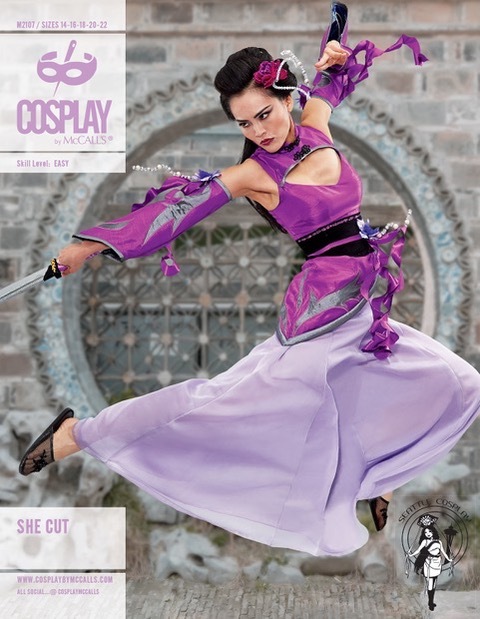 Her other Cosplay by McCalls patterns are Power Brace (M2102) and Pappillon (M2084). This packet contains a top, detached sleeves, a belt, and a beautifully-shaped eight-gore, 2-layer skirt (16 total layers). 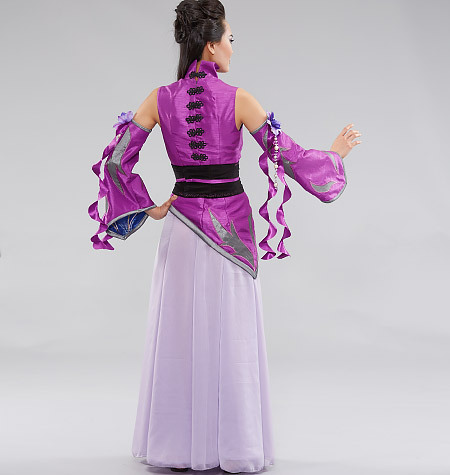 The skirt fits smoothly across the hips and flares out from there. Try a sheer over an opaque for the skirt, or two sheer striped fabrics for fun optical effects. The pattern asks to have the shorter skirt pieces on the top, but the picture sure looks like it’s the other way around. Either way will work. Though the top shows frogs as the back closure, they are as decorative as the frogs on the front. There is an invisible zipper up the center back so you will be totally covered when you ask for help closing up the frogs. The “sleeves” have the expected elastic at the top. Mix and match these with just about anything. The skirt is reason enough to get this pattern. Ala Glow (M 2104), skill level easy, is Becka Noel’s newest pattern and is a good companion piece for Flight (M2015). Ala Glow is a set of wire-framed fairy wings, a little pillbox “hat”—or fascinator—and stockings. No skirt or bustier. Yes. Stockings, not leggings. They have feet. LOOK AT THE FEET! Suddenly so many costuming issues are solved. In the line drawing it looks like there is a seam under the heel, but those are only darts on the sides. There are no irritating seams under the foot. There is a separate waistband, and I can’t readily figure out why. I think I might just cut the waistband in one with the body of the stocking pattern instead for a smoother finish. Be sure to check to see if the length and feet will fit you before you cut into your good fabric. Leggings have a built-in save that stockings do not. The fascinator is really a slipcover for a piece of foam or a sponge you cut to size. The instructions tell you to make two covered circles of foam, finish them and then glue them together like a short stack of pancakes. I suspect this is to make it easier to insert the foam/sponge by making smaller chunks of filler to fold and insert. Otherwise, it’s just extra work. If you feel confident, you could glue the foam first, and either sew the two sides together, or cut-in-one at the correct size. This way you need only one top and bottom—but include interfacing or another layer of fabric with the bottom to make a firmer support for the hair clip you will add later. The theater costumer in me says to please use three clips. You don’t want the fascinator flopping around. It’s distracting. While you are in there, insert the ruffle into the bottom seam and avoid the extra cutting and sewing of the stay. Get fancy and pleat the ruffle instead. The wings are a good tutorial for building fairy wings. Two methods of construction are included: one with the wire support frame glued, and one with it first bound together by wire, then glued. The wire-bound version is stronger. Having built my share of wings, I’d advise you not to do the glued version. It simply will not hold up. On about my third pair of wings, I settled on soldering my frames together, which I liked the best because it could be done while lying flat. This assured that the frame did not twist while I was building it. If you know how to safely make a clean solder join, go for it. Bouquet de Fleur (M2096), skill level advanced. Oh my goodness, J. Hart Designs. You do beautiful work. 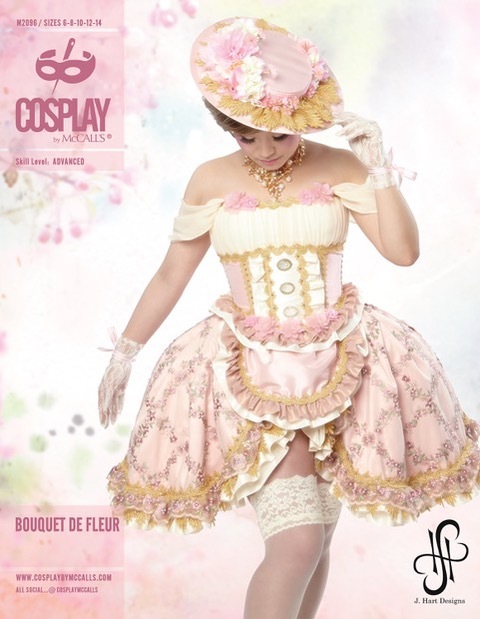 Bouquet de Fleur is a sweet little pannier, skirt with apron, and bodice. It’s all about gorgeous proportions over perfect panniers. It’s not harkening back to anything, save for maybe Spectral (M2053). This is its own thing. Sadly the hat shown is not included (nor are the lace gloves). But to be sure there is a lot in this packet, both in number of pattern pieces and uses for the pieces. You can put the pannier under your historic costumes. It’s the usual five pieces. Four if you buy your waist tie instead of making it. Don’t forget to put a bound slash in the top so you can used them as enormous pockets. With this little skirt they would be easy to access. Keep them stuffed full of flower petals. Grab handfuls out to toss over your head as you promenade though the halls. Super green! The skirt is just a front, back, waistband, apron, and a ton of ruffles. No more or less than it ought to be. Use some really extravagant fabric here. There is a lot of impact for a small amount of yardage, and 18th century costume begs for excess. Save a scrap for the center front of the bodice. The rest can match the apron. 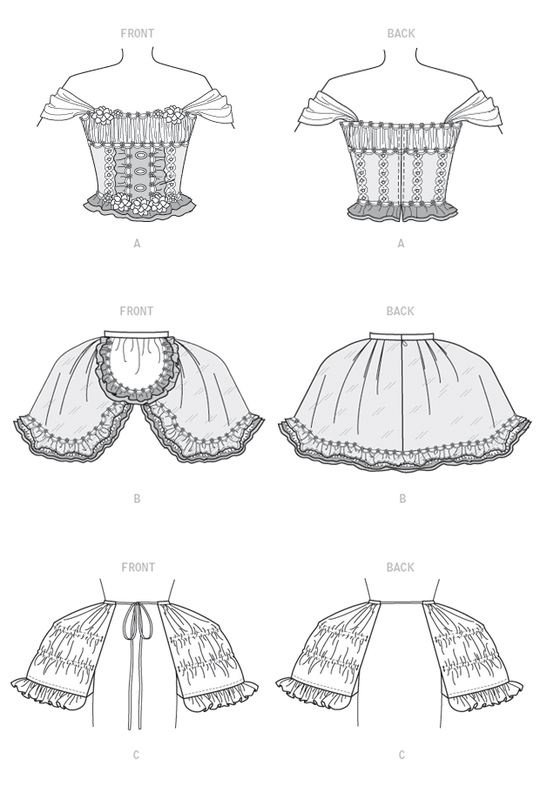 The bodice is a symphony of 19 pieces but it is basically a 7-piece bodice with tons of gingerbread on it: ruffles, overlays, sleeves and then the lining. It’s lightly boned so that it stays up but it’s not a corset. There are bra cups you build behind the bodice top shirring. These are necessary because the boning does not extend to this softer part of the bodice. It also makes a ready spot to create a bust. Just pin in bust pads, or stick in a couple of cutlets. The closure is a center back separating zipper. It’s really a lovely ensemble grounded in beautiful design. Thank you once again for an excellent review. I appreciate you injecting your own costuming experience and expertise into the write-up. Brava!